Where there is a clear authority figure who are empowered to make the final decision. Sometimes this can be outside forces (e.g. economic conditions or maybe even ‘head office’). Thus the onus is more on successful execution of the decision made by others. On other occasions we may pass the responsibility of decision making over to someone else (because we do not really care what the result is or maybe because we believe the nominated person will make a better decision). When someone asks you to do something without leaving room for other options, they give you orders. It’s pretty common in military operations, or even families with strict parents (e.g. Tiger Mom). When it happens often in your workplace, especially if you’re a designer, it could be culturally unhealthy. Where a person vested with the power to make a decision first consults widely before making a decision. There is a difference between asking someones opinion and actually doing what they recommend (as there will always be different points of view expressed during consultation). If you are a designer, you should be very familiar with the consultancy type — think design critique sessions. You present a design and get feedback from your audience, aka other designers. Before the critique session, you should have been through brainstorming, and picked a few of your favorite design directions. For the directions you didn’t pick, you know the reasons. Now, you’re ready to present your selected directions, get feedback, decide on one and move forward. Remember, you’re the ultimate decision maker. The democratic way where the most votes wins. 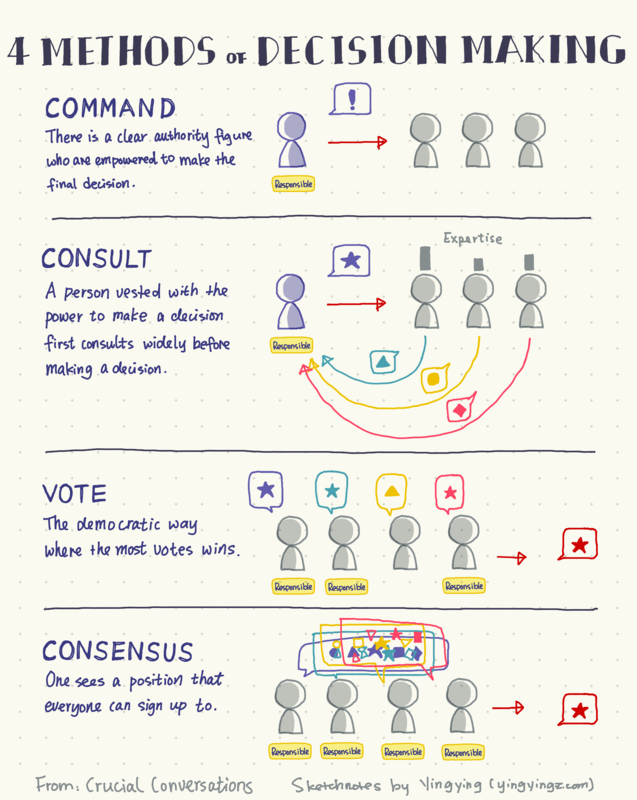 In the Vote scenario, everyone votes, and the decision goes to the option that gets the most vote. Does that mean that decision is the best decision? Of course not. The voters could have different levels of expertise, and may or may not have certain biases. The end result though, everyone needs to go with the voted option. Where one seeks a position that everyone can sign up to. This can take a long time and lead to a sub-optimal compromised decision being agreed. In various occasions, you need to get aligned with other teams and reach an agreement. Beware though, getting consensus signifies that you are becoming “one of them”. Think: if the decision ends up going horribly wrong, who’s going to get fired? All of “them”. Be sure to express your perspective and opposition before the agreement, or you may just miss your opportunity. Also, your perspective may change things around.